When I was a kid, I collected stamps. My grandparents traveled a lot and would bring me stamps from around the world, plus they had a travel agent friend who would save me all her canceled stamps. My parents got me a subscription to receive the First Day of Issue stamps from the US Postal Service. I checked out books from the library to learn more about my stamps and the countries they came from. I was even in a kids' stamp collecting club for awhile. I loved getting new stamps and I loved carefully soaking and drying canceled stamps. I loved checking maps to see how far my stamps had traveled and I loved seeing the way other countries spelled their names on their stamps. I loved putting the stamps in my album and I loved going back and looking at the ones I had. But more than anything, I loved seeing the different colors, designs, and images on stamps. Every stamp was a work of art. Lots of countries featured beautiful flowers, landscapes, animals, and things like that. Many had featured a country's ruler or leader. I was especially fascinated by the countries who would honor American entertainers or athletes or even cartoon characters on their stamps. It seemed so strange that a country on the other side of the planet would randomly issue a Donald Duck stamp, for example. I learned a lot from my stamps. 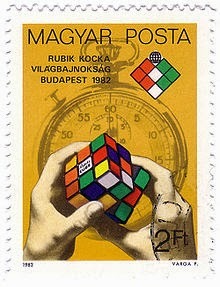 Did you know that the Rubik's Cube was invented by a Hungarian man or that the first Rubik's Cube World Championship was in Hungary in 1982? My stamp collection is at my parents' house. I haven't looked at it in years. But I've been thinking about it the past few weeks. It only occurred to me recently that by saving and organizing stamps, I was actually collecting art on a scale that was small enough and affordable enough for a kid. My stamp album was my own personal art gallery, where I could sort and rearrange and organize tiny works of art. 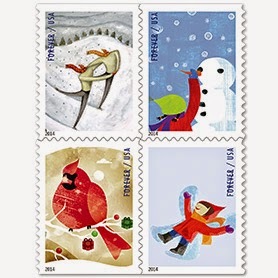 As usual, I bought holiday stamps to put on my Christmas cards this year. Usually, there is at least one secular set that I love, plus a religious set based on famous paintings. This year, I liked the Rudolph the Red-Nosed Reindeer set and the Winter Fun set, so I bought them both. It wasn't until I started putting stamps on envelopes that I saw a design flaw of sorts that I'd never noticed on a stamp before. Look at the Rudolph stamps. They're really cute as a group of four, but that's not the way they appear on an envelope. 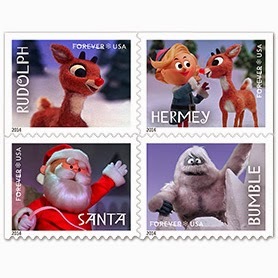 The Hermey and Bumble stamps are fine, but both Rudolph and Santa are facing strongly to the right. When they're on their own on an envelope in the upper right-hand corner, they lead the eye right off the side rather than to the address. That's a big no-no in graphic design. The Winter Fun stamps all face left, except for the couple who are headed right off the edge of the envelope. I only ever collected 1 stamp...the one they created w/ Marilyn Monroe's image on it. I did that because I have been a huge MM fan since I was a tween. I have it and all my other MM stuff in boxes in the attic. I almost went a bought the Harry Potter set when they came out, but realized there was really no point as I don't really collect stamps. I like what you said about stamps being an affordable art collection for kids! I had never thought about it that way! I wonder how much longer stamps will be around though? I know I buy a book of them and they last me forever as I pay most (all) of my bills on line and/or any correspondence is through e-mail or texting. P/s: I'm sure Trevor would love to inherit your stamp collection.